‘He has an aura’, but does Beto O’Rourke have any policy positions? The Texas Democrat has a campaign website up and running. It includes features to donate to the campaign, apply for a job on the campaign, and purchase campaign merchandise. What the website doesn’t have – a section describing O’Rourke’s policy positions. 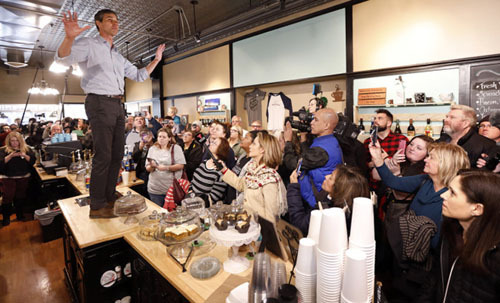 “O’Rourke’s message covers rhetorical territory familiar from the Obama era: positive and innocuous, but noncommittal,” wrote Dan Derozier, chairman of the Houston Democratic Socialists of America’s electoral committee, in a December Houston Chronicle op-ed. O’Rourke has also come under fire from some liberals in the months since his Senate race ended for appearing to break a pledge not to accept money from fossil fuel companies. Progressives have also slammed O’Rourke for his raising hundreds of thousands of dollars from hedge funds despite speaking out against corporate money in politics. But O’Rourke also espouses leftist beliefs, such as strong gun control measures including a so-called “assault weapon” ban and magazine restrictions. He has called for the border wall in El Paso, Texas to be torn down. O’Rourke has also embraced socialist Democratic Rep. Alexandria Ocasio-Cortez’s Green New Deal. O’Rourke said building up broadband and connectivity in rural communities is important. “They can’t get on Tinder to find a date tonight,” O’Rourke said of rural Iowans without Internet access.